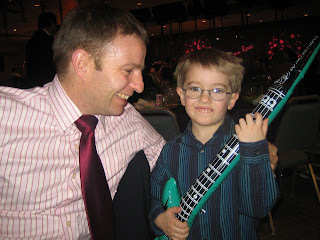 The Wilson Family: Bat Mitzvah's and Bears! Well Shawna's long awaited Bat Mitzvah finally arrived this weekend and it was more extravagant than most weddings I've been too. We all had a great time, hopefully you'll see some of what I'm talking about in the photos. Firstly the service was different. It was all in Hebrew although there was a Rabi who translated lots of it into English for the non Jewish people there. It lasted an hour and a half and Jacob and Abi survived pretty well. It was very interesting with the arrival of the Torah from the Ark and lots of ceremony too. Shawna did a great job - I obviously didn't understand a thing, but it seemed like she did a great job! Then the proper party started. Dancing was on the agender before any food. 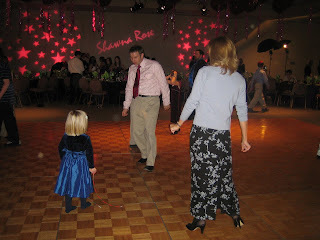 Shawna and Mindy (her mum) were hoisted up on chairs and danced about - see photo. There was also dancing around in lots of circles doing cross steps. I though this was a Greek Wedding thing. Everyone got involved and the kids loved it. We did then sit down for food although people danced through out - see photo of Allen, Abi and Kelli (our neighbour) dancing. Also note Shawna's name in lights on the wall. Mindy had gone to town on the decorations. There were large balloons and streamers hanging from the ceiling. Lolly pops with Shawna's name on together with tins of mints and lip glosses all bearing Shawna's name and the date. There was a photographer taking photos that they developed there and then and just gave to you. We've got a lovely one of the 4 of us. They did games for the children and there's a photo of Jacob proudly holding a blow up guitar he won. We left at 9.30 as Jacob and Abi were very tired but the party continued and Shawna finally left at 1am. 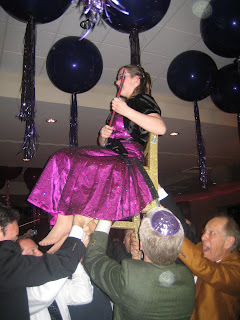 I'm glad we've experienced a Bat Mitzvah, if we do so again I may research Juadaism a bit more so I don't feel as stupid! 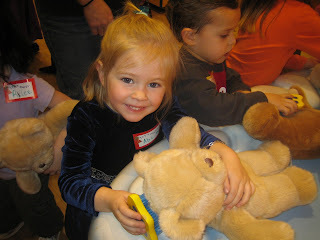 Today Abi and I experienced our first Build a Bear party. Beckett, in Abi's pre school class, turned 4. There were about 18 at the party and they got to stuff a bear, name it, groom it and play. There's a photo of Abi at the grooming station. After the party we chose an outfit for 'Sweatheart' (that's what Abi named it). She put it in a princess dress identical to the one that my mum bought for her for Christmas. It was good fun but I will be avoiding the shop in the future as Abi will expect a new bear each time! Jacob went to a friends during this and was not remotely interested in Abi's bear when we picked him up which was great. Allen's in the UK for the next 10 days so my sanity will be serverly tested. This is the longest he's been away since having the children. As he pointed out at least it's not a 15 month stint in Iraq like the Americans get here. So here's to 10 days going quickly! That looks like so much fun! Matthew just celebrated his 1 year birthday and is sleeping very well through the night. Hope to see you in July. We will definitely have to get together in July. I'm hoping to stay in Jane way for a few days at John and Mary's. I haven't contacted them yet though! I can't believe Matthew is one already.